Clcik on picture to view the video. A lawsuit has been filed against Diversified Industries, the cleaning subcontractor for Kmart, Target, Best Buy and other retail establishments. 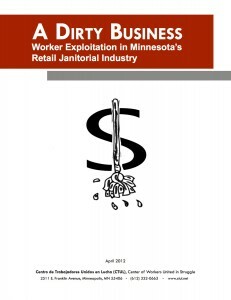 This report was presented at a rally in front of one of the Kmart stores that is cleaned by Diversified. 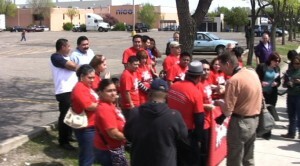 The report was released and the rally organized by CTUL (Centro de Trabajadores Unidos en Lucha/the Center for Workers United in Struggle) a worker’s organization. According to the report, department stores and supermarkets contract out their janitorial work seemingly to cut costs and avoid responsibility. There is fierce competition among the janitorial companies for these contracts, with each company trying to underbid the other. Since labor is by far the largest and most costly expense in a cleaning contract, the company with the lowest labor costs tends to win the contract. “I held two jobs because of the low wages. We work in a place filled with food and yet we can barely feed our families,” said Mario Colloly Torres who used to clean a supermarket and now works with CTUL. The CTUL report says that contractors count on the predominantly immigrant workforce not being aware of their rights or being afraid of retaliation if they complain. 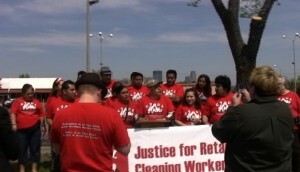 The report recounts one case where a Philadelphia cleaning company even went so far as to enslave their workers and to threaten the workers and their families with physical violence if they try to escape. The suit on behalf of the cleaning workers has been filed against Diversified Maintenance, a national cleaning company headquartered in Tampa, FL. Diversified has been sued a number of times over this same issue and other issues relating to working conditions. Michael Healey, the atorney representing the workers, said that Diversified does not like to go to trial so he anticipates a negotiated settlement as has been the case with other similar actions. Brian Payne, CTUL organizer, reported that the action last year against Super Valu and Cub demanding better treatment was amicably solved and both parties are pleased. Supporters of a higher minimum wage are are focused on winning votes in Minneapolis, while the city's attorney is racing the clock to stop the issue from going on the ballot. Veronica Mendez is a myth buster. Sadly, she says one of the biggest myths that needs busting is one of the myths Americans want to believe most about their country: The myth that if you work hard enough and long enough, you can succeed.